From this tutorial you’ll learn how to add content using Brands JetElements module for Elementor. Brands module helps you to showcase brands and companies on your website’s page. You can add brands, visualize them using brand logos, apply links to them and customize them in the matter of several clicks. 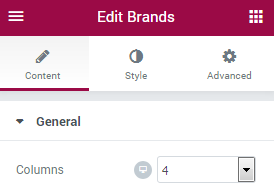 Columns — here you can select from 1 to 6 columns to showcase brands. Add Item — click on the button to add new brand. Company Logo — here you can upload or choose from the media library your brand image to showcase in this block. Name — in this field you need to input the name of the company brand. Description — here you can input the short description of the brand to give the visitors impression about it. URL — fill in the brand URL link. When clicking on the brand the visitor will be redirected to the brand page.